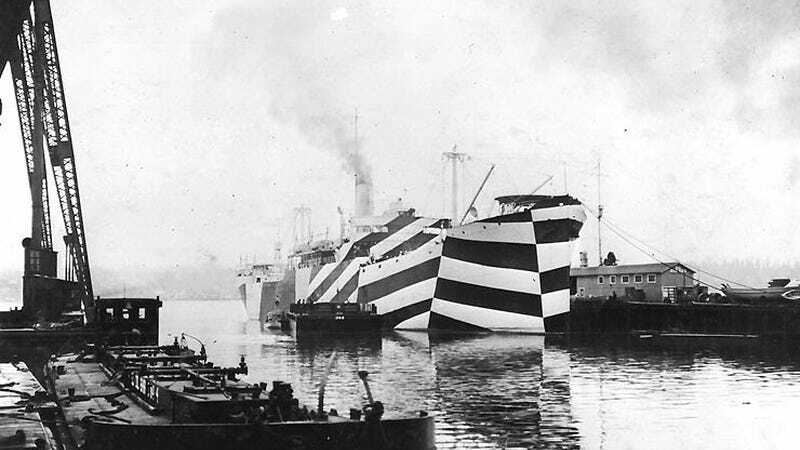 During World War I, ships were painted in zebra stripes to deceive the enemy. The effectiveness of this “dazzle” camouflage was never quite clear, but a new study suggests that these zigzag patterns can be quite deceptive when they move. Dazzle camouflage was invented by British marine artist Norman Wilkinson. The idea wasn’t to conceal a ship, but to trick enemy combatants. Ships painted in these zigzag patterns were difficult to discern, making it difficult for the enemy to estimate a target’s range, speed, and heading. Dazzle camouflage was adopted by both the US and British Navy. Each ship featured a different pattern to avoid classes of ships being recognizable to the enemy. Evidence for the success of dazzle was mixed, and the funky looking strategy was eventually phased out (though some ships retained these patterns well into World War II). Today, the technique is considered antiquated. A new study published in PLOS One has revealed how the dazzle technique could be improved. As it turns out, to make dazzle really effective, it can’t be static—it has to move. Researcher Joanna Hall, who works out of CamoLab at the University of Bristol, performed a set of experiments that showed how moving patterns on a target can twist and warp our perception of an object’s speed. Using computer-based visuals, Hall and her colleagues sought to understand how the perceived speed of a target is affected by the addition of a moving pattern. Their research shows that when a pattern on a target moves in the same direction as the target, the target appears to move faster. And when the pattern moves in the opposite direction to the target, it appears to move more slowly. The effect essentially causes an optical illusion. For an object the size of a Land Rover, that equates to a targeting error of up to 6.5 feet (2 meters) at a distance of 230 feet (70 meters) when the vehicle moves at 55 mph (90 km/hr). At its maximum effect, the perceived speed was increased or decreased by around 15 percent, and the effect also appeared to be robust under stressful conditions. The dazzle doesn’t have to appear across the entire vehicle or target. The researchers discovered that the perceived speed of a target can still be distorted with only a small patch of the dynamic dazzle at each end. Hall said that one potential military application would be on vehicles that are at risk of attack from rocket-propelled grenades, as the distortion in speed perception could result in a targeting error, thus reducing the risk of a direct hit. Looking ahead, the researchers would like to take these findings and test the effect in real world conditions. Should it work, we might see a return of dazzle camouflage, though in its modern, dynamic form.